It is no secret that I am a huge fan of Sammy aka The Nailasaurus' nail art - I mean, honestly, who isn't, right?! I was pretty enthralled when I saw her Festive Floral Nail Art post.. and I immediately pinned them because I knew it would honestly only be a moment in time before I would replicate them. Sadly, I (as I normally do) didn't take a photo right away.. so.. they are a little bit 'worn'. I even tried to use my watermark to cover a weird chip - I know, I am beyond clever. Love these. The lady at the MAC counter said they remind her of pin-up nails - I couldn't agree more. 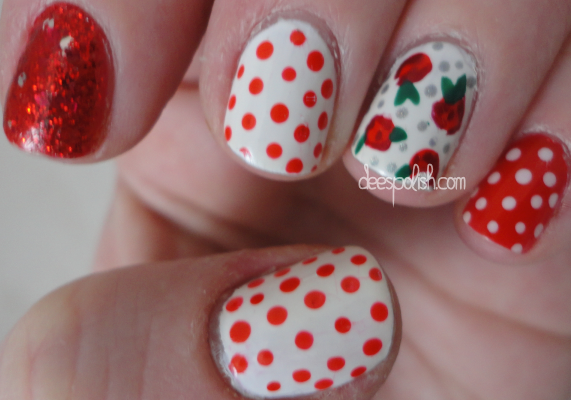 Thumb & middle finger: 2 coats of China Glaze White on White and Formula X for Sephora Flashy for the dots. That is all for now - see you all again real soon!! Pink, Purple, and Blue Gradient..